Did you have a nice Mother's Day? I hope so. My family came over for a potluck brunch and we had lots and lots of delicious food. I'm not much of a cook, but most of the deviled eggs that I made disappeared, so they must have been okay. I tried a new recipe with horseradish that I wasn't too sure about. That White Tea soap from Cost Plus smells SO good I bought some for me, too. I am ready for a juicy new knitting project and finally decided on the Multnomah shawl from Hello Knitty with my Misti Alpaca yarn that I adore. It's a fun knit. For those of you in the states, do you watch American Idol? This is the second season I am hooked on it. Now that we're down to four it's pretty exciting. I've been rooting for Crystal, but I'm okay with Lee or Casey winning. Well, off to watch Idol and work on my shawl. Talk to you again soon. 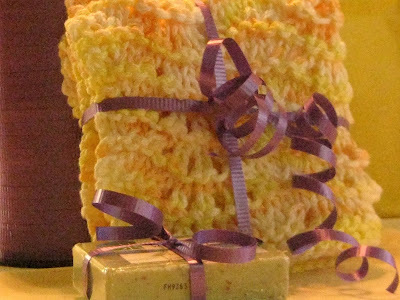 What a lovely gift for your friend:) The yarn for your shawl is amazing! Your shawl will look delightful next winter! Lovely colours! I watch Dancing with the Stars but not American Idol. Have a blessed day my friend! HUGS! What a lovely gift! The shawl is so pretty. I love the feather and fan edging...so simple but elegant. I am a Lee and Crystal fan!!! I too am hooked on Idol..
That is a sweet gift for your friend. I do love deviled eggs and have used horseradish too! I like a little "kick" that it adds. I'm finished with my ATC and will get in it the mail this weekend. Nice post. What fun to have your family over for Mother's Day. Nice hand made gift for your friend. Your knitting is so beautiful and I love all the yarns that you choose. Eric does not have a TV so My Sissy was emailing me as the results come in. Very nice present for your friend!! That yarn is beautiful! It will make a lovely shawl. What a nice gift you made. I hope she loves it! 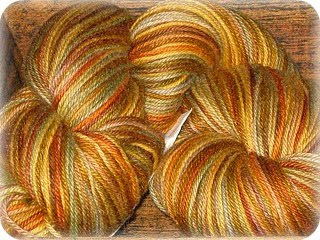 Can't wait to see the Multnomah - that's some beautiful yarn you've choosed for it!